Bacary Sagna, right-back for the Arsenal football club and the French National Team, recently joined Grassroot Soccer as an ambassador. Bacary had this to say: “In Africa soccer is like a religion. I see that Grassroot Soccer is using the power of the game to improve the lives of many young people across Africa. I am African and I play the beautiful game. 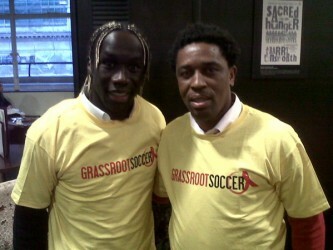 So I am very excited to be part of the Grassroot Soccer team”. Grassroot Soccer, an international non-profit, uses the power of the game to educate, inspire and empower young people to live healthy and productive lives. Dr. Thomas Clark, a pediatrician, and Methembe Ndlovu, the former captain of the Zimbabwe national soccer team, founded Grassroot Soccer in Bulawayo, Zimbabwe in 2002. With support from the Bill and Melinda Gates Foundation they developed a successful model to specifically tackle the AIDS epidemic – arguably the worst humanitarian crisis in history. 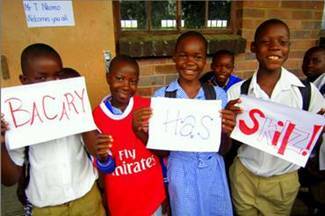 Grassroot Soccer trains local role models – soccer players, teachers, community leaders- to deliver an interactive AIDS prevention and life skills curriculum to at-risk youth. Over 370,000 young people have gone through the program. The goal is one million Grassroot Soccer team members by the 2014 World Cup. 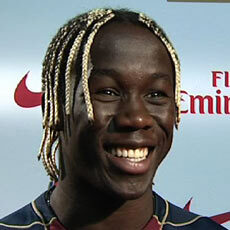 Dr. Thomas Clark had this to say: “Bacary Sagna is one of the best players in the world. I have always respected the way he conducts himself on and off of the pitch. We are thrilled to welcome him onto the Grassroot Soccer team. As an ambassador, he will inspire millions of young people”. To hear an interview with Bacary Sagna from the BBC News World Service about his new role as a Grassroot Soccer Ambassador, click here; the interview is at the 9:20 mark. For more on the Arsenal Football Club click here. For more on the French National Football Team click here.